A space frame is a truss-like, lightweight structures rigid structure constructed from interlocking struts in a geometric pattern. Space frames usually utilize a multidirectional span. The Space Frame, as the name implies, is a three dimensional structure which caters to the need of column free spatial area. It provides the required supporting structure while enhancing the aesthetics. Our firm is indulged in providing a wide array of Steel Space Frame to the valuable patrons. All our products are highly durable and easy to install. Offered product is made by our expert engineers employing high quality material and advance technology. Customers can avail these products at friendly pocket prices. We are emerged in offering premium quality Space Roof Frame. We are dedicatedly involved in manufacturing a wide array of Space Frames. Being a leading firm in this industry, we are offering a high quality range of Ball Nodes Space Frame Structures. 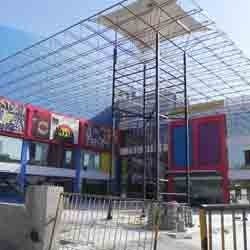 We are offering the quality range of Space Frame. The Space Frame, as the name implies, is a three dimensional structure which caters to the need of column free spatial area. Our structural Frames offers the required supporting structure while enhancing the aesthetics.